February 12, 2018 - (Silicon Valley Business Journal) - How'd the Bay Area End Up in a Housing Mess and How Do We Get Out of It? : "That was the stark conclusion from a discussion Friday morning between Joint Venture Silicon Valley CEO Russell Hancock, Metropolitan Transportation Commission chief Steve Heminger and Carol Galante, a former Obama Administration housing official." More. February 12, 2018 - (Palo Alto Daily Post) - High Cost of Living is Driving Out Locals: "A larger exodus from Silicon Valley is underway. 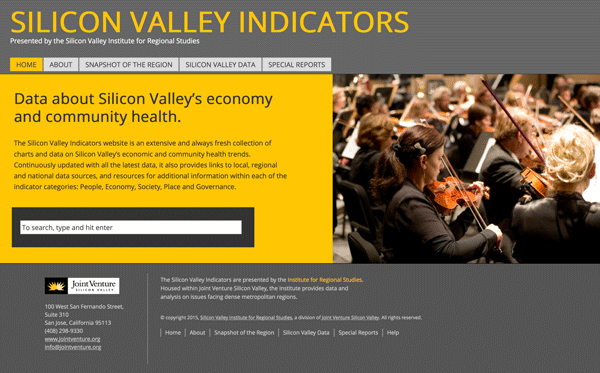 The Joint Venture Institute for Regional Studies released its 2018 Silicon Valley Index yesterday." More. February 12, 2018 - (Barron's) - The View from Silicon Valley: "Those are the ominous, but unsurprising, conclusions of the 2018 Silicon Valley Index released Friday by Joint Venture Silicon Valley’s Institute for Regional Studies." More. February 10, 2018 - (American Thinker) - Lots of People Leaving Their Homes in San Francisco: "Russell Hancock with Joint Venture Silicon Valley said, 'Silicon Valley has been this place that is growing. And it was mostly due to people relocating here and relocating from other parts of the world. That’s changing. '” More. February 9, 2018 - (Silicon Valley Business Journal) - In Search of the Elusive 'Big Fix' for the Bay Area's Transportation Woes: "...with snarled freeways and limited mass transit options, it’s harder to get around than ever, says Russell Hancock, CEO of Joint Venture Silicon Valley." More. February 9, 2018 - (San Jose Mercury News) - Silicon Valley's Economic 'Paradox' is Scrutinized at Conference: "'The paradox of our prosperity is we are the envy of the nation in our economic growth and job creation,' San Jose Mayor Sam Liccardo said during an interview, after speaking at the annual State of the Valley Conference organized by Joint Venture Silicon Valley." More. February 8, 2018 - (Sacramento Bee) - Capitol Alert: "Sen. Kamala Harris is set to deliver the keynote speech Friday at Joint Venture Silicon Valley’s 'State of the Valley' conference in San Jose, addressing the region’s economy, community health and future challenges. More. February 8, 2018 - (San Jose Mercury News) - Why Are All These Bay Area Residents Leaving? : "'Between July 2015 and July 2017, the region gained 44,732 immigrants but lost 44,102 residents to other parts of California and the country,' according to a new survey by Joint Venture Silicon Valley. More. February 8, 2018 - (San Jose Mercury News) - Packing Up and Moving Out: Bay Area Exodus Continues: "Overall, the region’s population continues to grow. But the number of outgoing residents has hit its highest point in more than a decade, according to a report released Wednesday by Joint Venture Silicon Valley." More. February 8, 2018 - (Silicon Valley Business Journal) - In Silicon Valley, Enjoy Good Times but Watch for Bad Omens: "But to hear someone like Russell Hancock, CEO of Joint Venture and president of its Institute for Regional Studies, describe the big picture these numbers represent, you might think you're hearing a different song." More. February 8, 2018 - (KPIX5) - San Francisco Bay Area Experiences Mass Exodus of Residents: "Russell Hancock with Joint Venture Silicon Valley said, 'Silicon Valley has been this place that is growing. And it was mostly growing because…people relocating here and relocating from other parts of the world. That’s changing.'" Video. February 8, 2018 - (Palo Alto Online) - Silicon Valley in 2018: More Success, More Pressure: "The Bay Area's fevered success is still rising, but its achievements continue to exacerbate the region's housing and transportation pressures, a new Joint Venture Silicon Valley report, the 2018 Silicon Valley Index, found. More. February 7, 2018 - (Silicon Valley Business Journal) - Joint Venture Provides Latest Silicon Valley 'Rorschach' Test: "'The world's most dynamic, innovative economy continues to create opportunity,' said Russell Hancock, the president and CEO of Joint Venture Silicon Valley and its Institute for Regional Studies. More. February 7, 2018 - (San Jose Mercury News) - Silicon Valley’s Spectacular Job Growth Creates ‘Harsh Environment’ for Many Residents: "'Silicon Valley continues to grow jobs at a rate anybody would envy,' Russell Hancock, president of Joint Venture Silicon Valley, wrote in an introduction to the report." More.